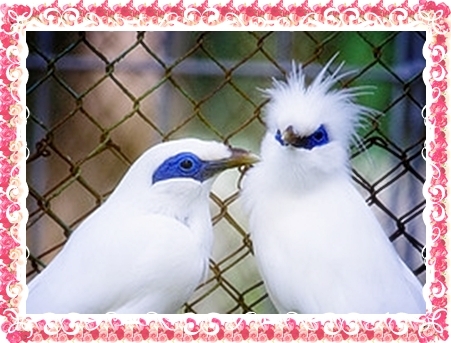 True Love - Bali Mynah Birds are the "Birds of Love"
An ancient myth states that birds choose their mates on February 14. Doves mate for life, making them a romanticized bird, and lovebirds are known for being touchy and dependant on their mate. Since June is the most popular month to get married and with many weddings planned this June, you should find this inspiring. Contrary to popular belief, another ancient story that relates to the origins of the term “Lovebirds” tells of a rare bird. The Bali Mynah are considered “the most affectionate bird” and have the distinguished reputation of creating the most lovely sounding Birdsong. An extremely beautiful bird, the Bali Mynah must surely define the provenance of the term Lovebird. Right now there are only about 13-14 Bali Mynahs left in the wild, so when you are making your wedding vows at your nuptial ceremony, think of this as you engage in the institution of marriage. More interesting facts surrounding this rare bird of love can be found at the site for the Honolulu Zoo in Hawaii. This entry was posted in Birdsong, June Weddings, Love, Lovebirds, Marriage, Soulmate, Unconditional Devotion and tagged birdsong, june wedding, love, lovebirds, marriage, soulmate, the meaning of true love, unconditional devotion. Bookmark the permalink.